It can be one of the most damaging and stressful events to happen in your home -- a wet basement. It causes inconvenience and costly repairs to be made. Homes in our Lower Mainland region should be protected from the constant damaging effects to buildings caused by being situated in a rain forest region. 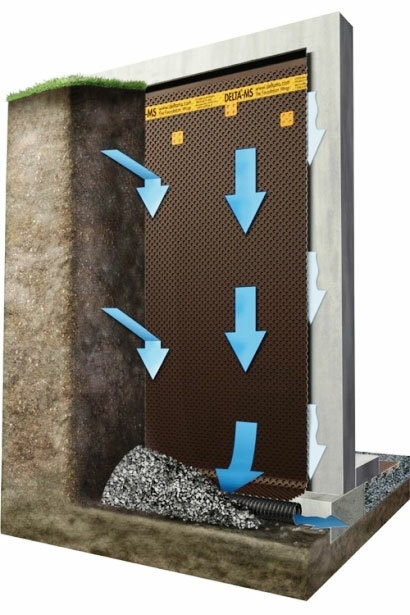 Delta-MS provides the foundation protection necessary to keep today's basements dry in the long term, with proven air gap technology and some of the best quality materials built-in. As long as gravity continues to be present on our earth you can't go wrong with Delta-MS! The unique design allows any water getting past the dimpled membrane to fall freely to the drain tile through the air gap section, keeping water away from your foundation and preventing hydrostatic water pressure against your walls. This same air gap allows the foundation to "breathe" and makes your whole home healthier. Some of the best builders use Delta-MS on all their projects to ensure their home buyers enjoy dry basements! Beware of cheap imitators - use original Delta-MS! 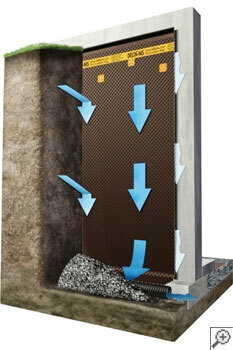 Call today to have Delta-MS installed by Certified Installers on your new foundation. Learn more at the Delta-MS website. We provide installations for MS-Delta in Langley, Vancouver, Surrey, Coquitlam, Maple Ridge, North Vancouver, Abbotsford, Burnaby, Port Coquitlam, Chilliwack, New Westminster, Delta, Mission, Tsawwassen, Port Moody, Richmond, West Vancouver, and the surrounding areas in British Columbia.